➢ “White Famous should be better than it is. The half-hour comedy is led by Saturday Night Live veteran Jay Pharoah, a winning impressionist … But White Famous, a shallow show about comedian Floyd Mooney (Pharoah) trying to break into the mainstream, accesses few of its star’s talents. Instead, Pharoah’s repulsive, juvenile character is hung up on his own myth of masculinity in his attempt to become ‘white famous’.” — Variety. ➢ “The series comes off especially tone deaf in its pilot episode thanks to a poorly timed story arc about a sexist, powerful Hollywood producer. … And even setting aside the thorny trappings of a Harvey Weinstein comparison, the series illustrates a casual sexism that’s concerning. In the pilot, there are more women who appear naked without speaking and without being given a name than there are speaking roles for women.” — IndieWire. 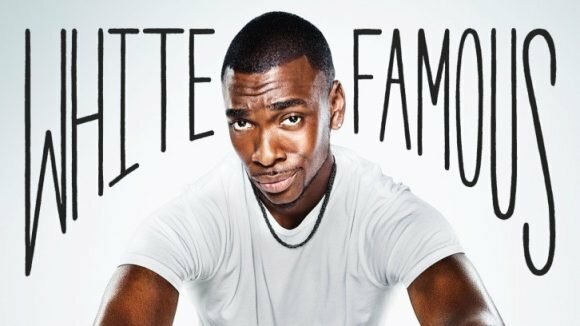 ➢ “White Famous is the latest in a depressingly long line of comedies about comedians and the indignities of Hollywood. Each time it stumbles into a zone of almost-originality, it backs away so quickly that it practically trips over the anonymous naked women it insists on sprinkling throughout the show.” — New York Times. ➢ “Created by Tom Kapinos (Californication), the series is produced by Jamie Foxx (who appears as himself in the premiere) and is loosely based on Foxx’s experiences as a rising young star. What could have been a smart and incisive look at Hollywood is instead a sluggish, shallow and often sexist knockoff of Entourage.” — USA Today. ➢ “White Famous is so corrosive that it ends up fighting itself. The self-loathing here is the type that’s common to so many Hollywood satires, filled with the requisite pythons and soul crushers who keep the sausage factory conveyor belt moving. But much of this goes beyond loathing to self-lacerating. … Awful.” — Newsday.